Garlicky roasted cherry tomatoes are one of summer’s great joys for my family. 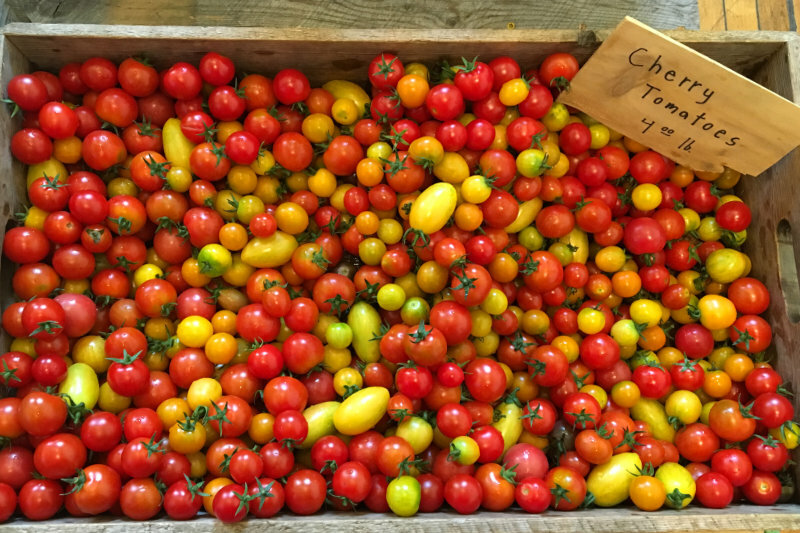 If you’ve only ever used these in salads, here’s an opportunity to discover a whole new reason to grow lots and lots of cherry tomato plants. My greenhouse is overrun with them lately and the little gems are coming in at the Market Garden at the Red Barn. Note: Don’t be afraid of the garlic – use as much or as little garlic as you like. Once roasted, the garlic has a mild flavor that’s almost sweet. Preheat the oven to 400 degrees. Line a large baking sheet with parchment paper for easier cleanup. Mix all of the ingredients in a large bowl and pour onto the baking sheet. Bake for 30 minutes. Enjoy the roasted cherry tomatoes over pasta or rice topped with grated Parmesan or use them in place of sauce for pizza. This recipe makes about four servings. Enjoy!